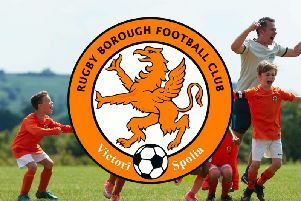 Saturday saw Rugby Borough FC play their last home game of the season against Asfordby FC, and the first meeting between the two sides. A delayed kick off didn’t deter the Borough lads from starting well and opening the scoring in the eighth minute; Connor Gamble producing a superb strike from Adam Shaw’s cross. It wasn’t long before the second ball found the visitors net. Shaw calmly slotting home from a Jamie Paye through ball. The visitors were struggling now, and Borough had no intension of letting up on the pressure, pushing the score to 3-0 after 32 minutes, and another from Shaw. Asfordby offered more in the second half, but Borough’s back four were defending well, and the game became scrappy. Borough finished the game strongly, with a fourth and fifth from striker Jamie Paye. Full time 5-0. Borough remain top of the Everards Leicestershire Senior League Division One table with five points clear and seven games to play.